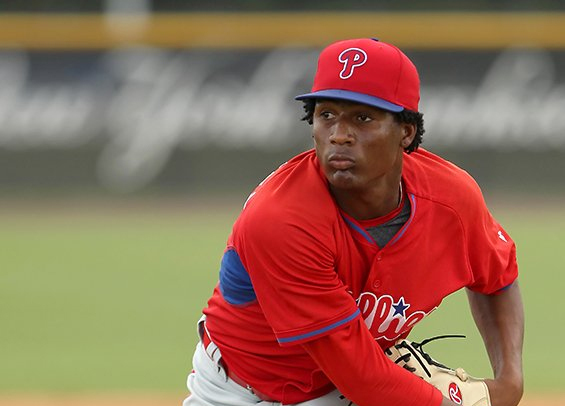 Sixto Sanchez, Philadelphia's top-ranked prospect, will not participate in the Arizona Fall League, according to reporting from NBC Sports Philadelphia's Jim Salisbury. Per Salisbury's report, a source says the right-handed hurler experienced a setback with tenderness in his collarbone while rehabbing his injured elbow. The Phillies had hoped to have Sanchez pitch this winter as he appeared in just eight games this season before being shut down in early June. The 20-year-old chalked up 45 strikeouts over 46 2/3 innings in eight starts and pitched to a 2.51 ERA. He's projected to be a top of the rotation starter and touted as one of the hardest throwing prospects in the minors today. The Arizona Fall League opens play on Tuesday with seven other Philadelphia prospects playing for the Scottsdale Scorpions. Included on the roster are right-handed pitchers Luke Leftwich, Seth McGarry, and Tyler Viza, infielders Darick Hall, Arquimedes Gamboa, and Luke Williams, and outfielder Austin Listi. The season runs until mid-November.